Gretchen Bleiler is one of the most accomplished female snowboarders in the world. As a top to her incredible list of medals and contest wins, Gretchen won the silver medal in Women’s Halfpipe at the 2006 Winter Olympic Games in Torino, Italy. Gretchen aspired to compete in the Olympic Games from a very young age and found her passion in snowboarding at age 11. She has been riding ever since and is now recognized as a role model and pioneer in the sport. In 2008, Oakley launched the Gretchen Bleiler Collection, their first ever athlete-dedicated signature line of outerwear, apparel, accessories and eyewear. In the summer of 2008, Gretchen acted as the on-air host for Yahoo! Sports during the 2008 Summer Olympic Games in Beijing, featuring daily 3-minute updates and athlete interviews. In addition to the Olympic Games themselves, Gretchen covered the Olympic Trials for Gymnastics, Swimming, and Track & Field. Gretchen is an active spokesperson in the environment and global warming. She has utilized her platform by working with her sponsors to help create lower impact products within the snow industry. She has also been a public speaker on the issue at High School's and colleges and created her own call to action The 21 Day Reusable Challenge (21dayreusablechallenge.com). 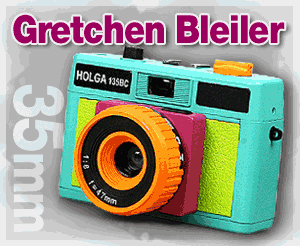 Gretchen also enjoys surfing, yoga, interior design and fashion. In April 2008, Gretchen founded the first-ever, all-girls annual snowboard Halfpipe competition, the COVER GIRL Snow Angels Invitational. The event includes top female snowboarders from all over the world. On June 19th, 2009 Gretchen married her long-time boyfriend, Chris Hotell in Costa Rica. Gretchen was chosen by Barbie as one of "10 Women to Watch in 2010" as part of the Barbie "I can be..." campaign. Barbie’s “10 Women to Watch in 2010” salutes women who continue to innovate and forge paths to be followed by others. Each of the women chosen is a trailblazer in her respective field and continues to dream big, both for herself and for a future generation of girls. As part of her role, Gretchen committed to mentoring a girl, through Barbie, in celebration of Take Our Daughters And Sons To Work Day. August 2010 marked a new phase in her entrepreneurial exploration. Together with her husband Chris, Gretchen debuted her reusable/sustainable water bottle company, ALEX, found at www.alexbottle.com.